Good day, everybody!!! Gloomy autumn days are heavily upon us with winter approaching quickly and temperatures dropping like crazy. I often looked up to the bird kind and felt a bit jealous of how they carelessly leave everything behind once summer is gone and leave to warmer places. Plus, they can fly!! Well, at least we've got our GPUs and monitors to keep us cosy during these awful, cold days. Of course, they alone would only comfort us physically, the software is the one that really puts a geeky smile on our faces. Ubuntu was the first that made the cold season Tux collection, with Fedora following closely and openSUSE graciously touching the third place - I haven't tried the latter yet, but there's a lot of enthusiasm among users. Today I am here to show you Fedora 16 - dubbed Verne. I am sure Mr. Jules would write an exciting story about brave distro hoppers, were he alive today. I am really pleased with this codename, as it perfectly complements the overall adventurous spirit of GNU/Linux, especially when it comes to the cutting-edgeness offered by Fedora. Now, there's a lot of desktop environments to choose from when you decide to go Fedora: KDE, GNOME, LXDE, Xfce. 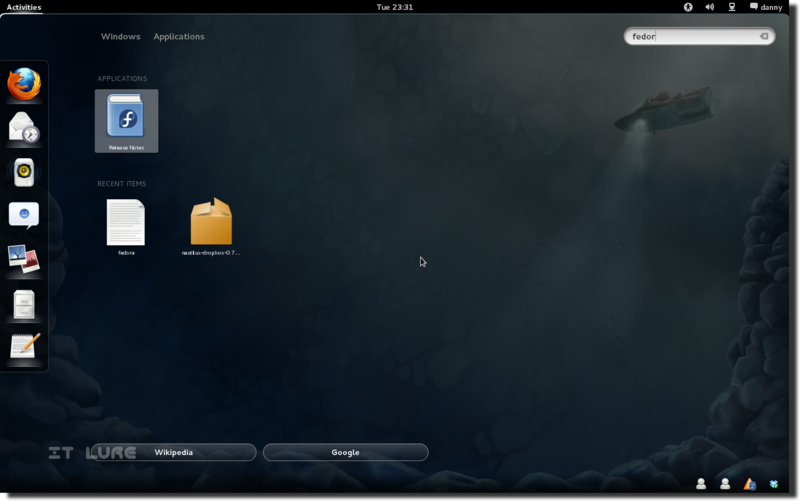 The official version is the one accompanied by the latest GNOME release and that's the door I decided to open, as I really have had a lot of positive experiences while using GNOME Shell. It even ended up replacing Unity inside my Ubuntu install. 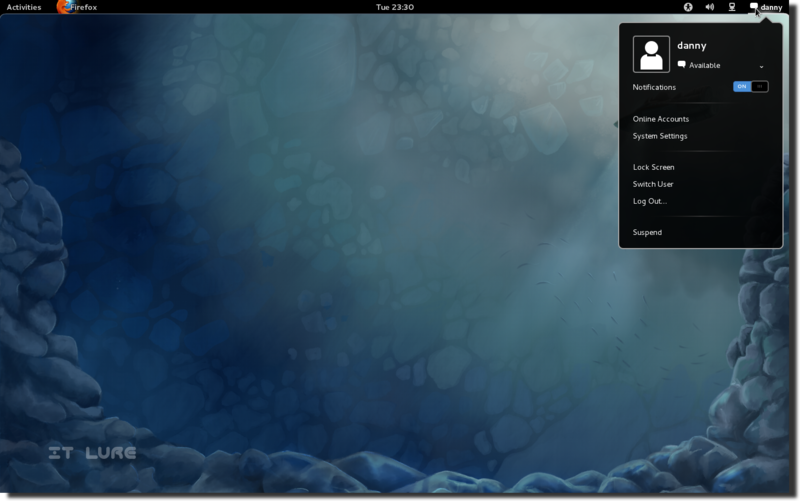 Everything feels very natural when using GNOME 3, and the desktop just flows. But more on that, later! The ISO maintains a reasonable CD size, measuring just a bit over 600 MBs. I am of the opinion that the developers could have made good use of those ~100 MBs and include some extra apps, but it's not that big of a deal. As it is much faster, I decided to use my trusty USB drive and boot the ISO from it. That made the live environment load quicker. The "Install" button was right there in the dash launcher (press the "Super" key or move your mouse to the top left corner of the screen to unveil it). The installation couldn't be simpler: easy to understand choices for almost all scenarios: replace existing Linux partitions, shrink current systems, replace everything, etc. As I have a second 40 GB HDD that has the sole purpose in life of hosting distros for IT Lure, I selected the option to erase everything from it. Oh, if, like me, you want to install the bootloader to the same second HDD (so as not to risk destroying your main one), remember to fill the radio button underneath "bootloader". With that, I can have a truly separate testing environment. As in pure Fedora fashion, the whole installation lasted for less than 5 minutes. User creation is the first thing you need to do before being able to boot into the newly installed Fedora 16 system. I also suggest sending your hardware profile to the Fedora labs in order to have improved compatibility in future releases. Phew! 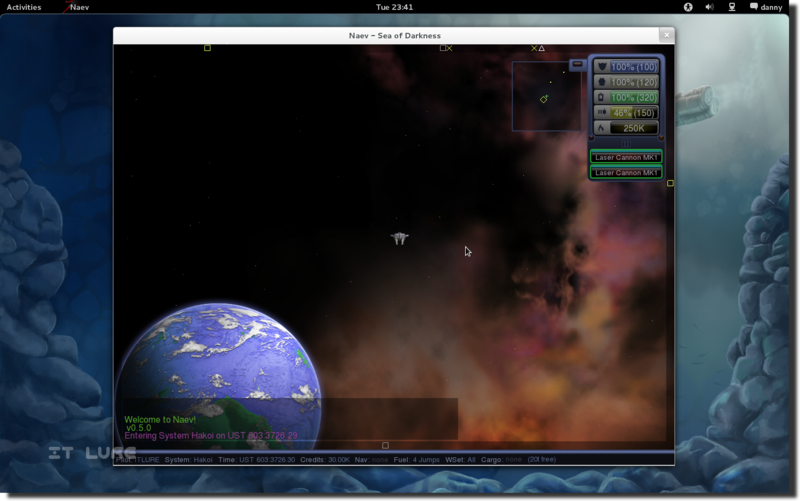 Fedora 16 is now finally ready to be explored and appreciated at its full potential. One of Jules Verne's "trademarks" has to be the submarine, with which captain Nemo was able to rip himself out of society in "20000 leagues under the sea". 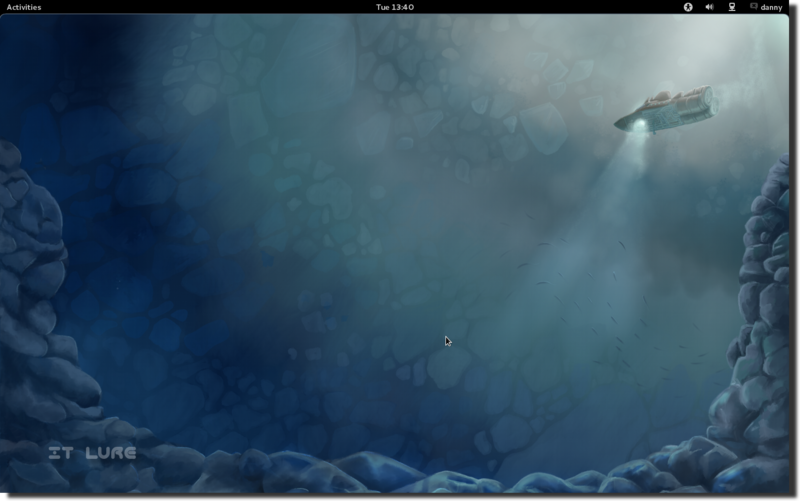 As expected, the wallpaper depicts such an underwater vehicle and it does so very artfully. The ocean, with its cool colors, provides a nice and relaxing sight for sore eyes. The UI elements themselves are in the classic (black) GNOME 3 style. Sadly, the developers decided to use the same ugly default folder icons. 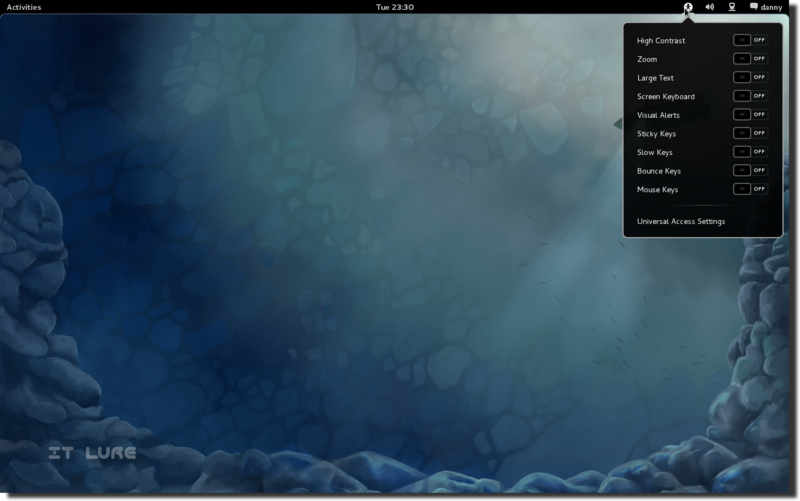 Still, they integrate better than in previous GNOME 2.x versions. What is also a Fedora "defect" is the poor rendering of fonts, especially on webpages. Sure, there are ways to fix it, but the default configuration is not so pleasing. 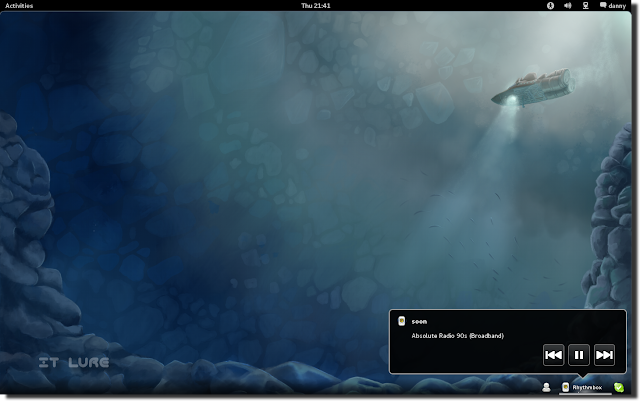 The GNOME Shell comes with a black bar at the top, displaying an "Activities" button, followed by the in-focus application tab, the time in the middle and some system settings like "Universal Access" (making computing easier for the impaired), volume control, network manager and the user menu, allowing to quickly alter your online presence, change system settings, lock the screen, switch users, log out and finally, suspend. Yes, there is no visible "Shutdown" option and no visible explanation on how to actually do it, which is, to be gentle, a weird decision. The solution is to hold the ALT key and the "Power Off" option will appear instead of Suspend. This reminds me of Windows Vista with the "shutdown" button actually suspending the OS, and the actual shutdown option being hidden behind a small arrow. Moving your cursor over the "Activities" button in the top left corner (or pressing the "Special/Windows" key) quickly activates the dash, which scales all of your open applications to fit on the screen so you can easily switch between them. On the left hand side, a launcher bar shows some of the most used apps. Of course, you can change their positions, remove some of them and add others by dragging and dropping. The "Applications" tab displays all installed applications. If you want to narrow your search, you can select a category from the list on the right. But the best way to get to a desired app or file is to start typing its name. In a matter of milliseconds, it will appear in front of your eyes. You can even search directly on Wikipedia or Google, using the respective buttons at the botton. On the far right of the screen, the workspace switcher lets you navigate between virtual desktops. At first, when there's nothing but the desktop active, only one workspace will show. The moment you bring something up (a folder or an app), another empty one will appear. If you fill that too, a third will come for backup, and so on. At the bottom right corner, the notification icons will be shown and you can even quickly continue existing IM conversations without having to bring up the Buddy list window. Moreover, when someone sends you a line in Empathy, it will pop up from the bottom, even if you don't have the "Dash" active. Again, you can use that elegant pop-up to rapidly respond and return to your work. All in all, I find the GNOME Shell experience more natural and richer than Unity and certainly a step forward from GNOME 2.x. It may be a little less configurable, but it fits my needs like a glove. 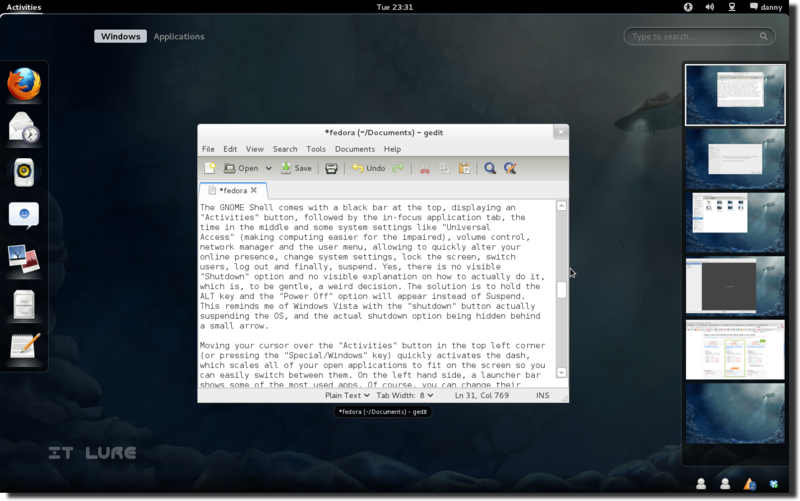 I know that for many of you that is not the case, but I am a happy GNOME 3 user. 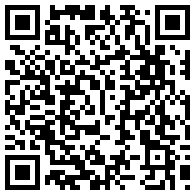 As Fedora's philosophy outrules the use of Flash, you will have to download it yourself from the Adobe site. Don't worry, the installation is a completely painless process. Fedora 16 ships with Firefox 7.0.1 for web browsing, the Evolution email client, Rhythmbox audio player (with a great selection of online radios), the Shotwell photo manager and the usual bunch of useful accessories. If you want an office suite, tough luck, you will have to download it yourself from the repositories. The "Add/Remove Software" application, otherwise sufficiently well stocked and easy to use, is, compared to Ubuntu's Software Center, years behind. The Nautilus file manager comes with a nifty enhancement that allows you to quickly preview selected files by pressing the spacebar. It's not as smooth as I would've liked, but it does the job. On the other hand, for some messed-up reason, the "Del" key doesn't work anymore, so if you want to delete something you will have to right click and select "move to trash". Another interesting addition inside the context menu is the "Restore Missing Files" option, which lets you connect to an on-site or cloud server to recover from accidental deletions. By reading Fedora 16's release notes (you can find it in the menu), I discovered an interesting space exploration game which seamlessly weaves a classic arcade-ish gameplay inside a complex strategy game: Naev. I've also discovered "Ease", a presentation creator that is very, ahem, easy to use, but kinda crashes from time to time. :D You can insert pictures, PDFs, videos and can even search through Flickr and OpenClipArt for relevant images. Well, theoretically, as it didn't yield any results, regardless of what I was searching. It needs to mature, but I like it. Would you take it on an isolated submarine? Yes, I sure would! As a home, office or Edu OS, Fedora does a great job, and it does it with complete freedom from proprietary software. And even if you don't care for its philosophy, you can add custom repositories and transform it into whatever you want. GNOME 3 is not perfect but I believe it is on the right path of evolution and I can hardly wait to see how much better it will become in the future. With that said, I welcome you to the comment section for a friendly discussion about why you like or don't like this latest release of Fedora. Or we can talk about spider pigs. Your call. See yaaaaaa! 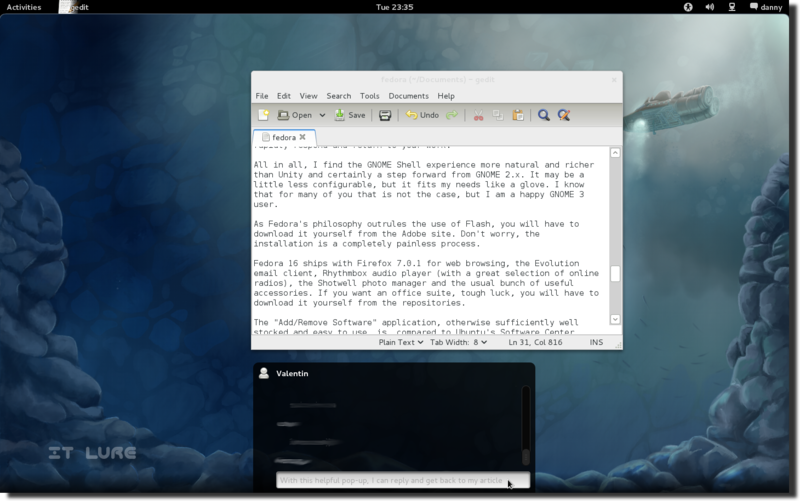 I also liked Fedora 16 GNOME. But not to the point of getting it installed. 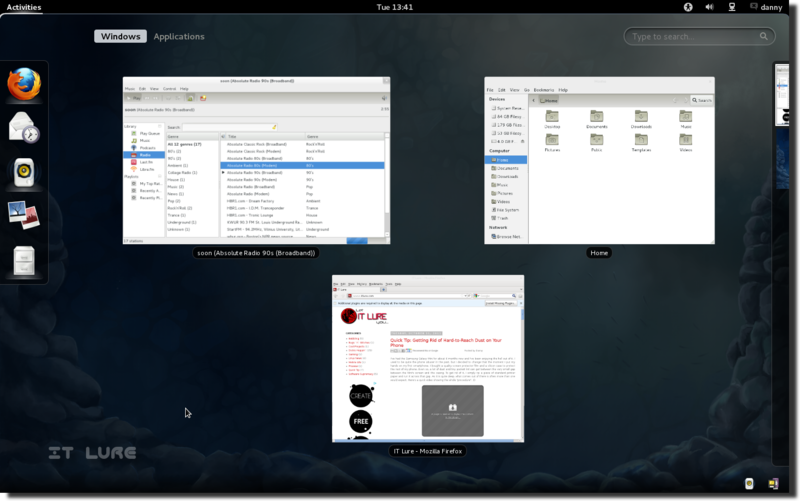 I also tried KDE (Live and Installed) and XFCE versions: they are all under this link.